Now what ever happen to the acorns? 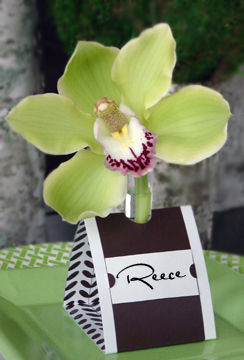 Well, I changed my colors and now I have half finished acorn place card holders sitting in a box. I am NOT repainting all of them and gluing again ...no way! 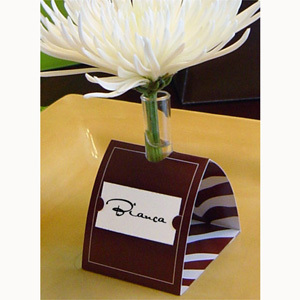 I needed some easy cheap place cards and holders. I really like the blumebud...but the cost is crazy for just 6 ...around $10 plus shipping = two 12X12 card stock and eight 4 or 3.75 inch water tubes. You can purchase double sided 12X12 card stock for under $1 a sheet the tubes run about .10 each. I am using the scrap leftover from my diy pocket fold. I also plan on stamping a peony pattern on them. Anyways...on to the tutorial! Measure out four sections of the 3X12 according to the template above. 2.5", 3.5", 3.5", and 2.5"
With your tool you have chosen score along the fold lines. Measure the diameter of your floral tube and cut a circle to fit. Make sure you have it centered. Overlap adhere the 2 bottom flaps together. Your bottom should measure 3"
In the hole place a tube with flower. where did you buy the tube vases if I may ask?